VFL: Round 13 win in 60 seconds Watch highlights from Collingwood's 13-point win over the Northern Blues in round thirteen of the VFL. Jesse White soars high for a mark over Blue Liam Jones and teammate Adam Oxley. It could have been round four all over again. The VFL Magpies jumped out of the blocks and took an early lead over the Northern Blues. With a victory seemingly secure, the underdogs in navy blue make a late charge towards the finish line. They get close, but eventually fall short. Sound familiar? It’s happened twice now. Playing in front of a large home crowd at the Holden Centre, Collingwood jumped out of the blocks in the first half of its round 13 VFL outing against the Northern Blues. From the first seconds of play, Jarrod Witts won hit-outs with ease and Ben Moloney had the quick clearances to follow as the Pies formed an early lead. Multiple goals from Lachlan Ferguson and Gus Borthwick saw Dale Tapping’s team take a 38-point lead into the first break. The dominance continued in the second quarter. Corey Gault, Jack Hellier, Jesse White and Tim Golds added majors at the Yarra River end of the Olympic Park Oval as the Magpies retreated to the change-rooms at half time on the good side of a 46-point margin. A new Northern Blues surfaced in the second half. So much so, that with the crowd at its optimum and the match at its climax late in the final term, Collingwood’s lead was cut back to just seven points. The Blues attacked once again. But this time it was a Black and White jumper that rose high above the pack to take a strong overhead mark. The wearer of the jumper was White. He kicked along the wing, searching for an opponent, but probably knowing the boundary may be just as good an option. In his first game back from an ankle injury, Tim Broomhead found the ball in his hands and the luxury of space to run inside 50. He weighted a kick perfectly to the waiting Howe. Howe goaled, and minutes later the VFL Magpies were victors. “There’s so much learning that we can take out of it,” Tapping reflected on the outcome post match. “We handled the last part of the past quarter quite well, given that the momentum was all against us. While Tapping praised his team’s ability to start games well, he is aware of the developing trend of letting opposition sides back into a contest. “There’s been moments over the last couple of weeks where we’ve just fallen away in aspects of our game,” he told Collingwood Media. 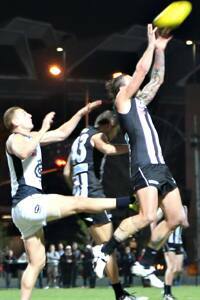 The Magpies had a number of impressive performers playing in a wide array of roles throughout the 13-point victory. The coaches named defender Adam Oxley, as well as VFL-listed teammates Matthew Smith, Ben Moloney, Lachlan Ferguson and Nick Gray as some of the side’s better performers. But there was a clear choice for best on ground and a clear word to describe his influence. “Huge,” Tapping said in reference to Jesse White’s game. “(It) shows the quality of him as a player, but also more importantly as an individual. With collective sighs of relief exhaled and win number eight comfortably chalked on the board, the VFL Magpies now enter a potentially taxing fortnight of football. Tapping’s side will travel to North Ballarat and Frankston consecutively before facing a round 16 bye.